On this post, you can read a complete Internet Jetset review. John Crestani keeps the program updated so there is new information on this article as well. This review analyzes the training of the program, the support, pricing and you can read my opinion about the guides and the videos you can find in the members’ area. Internet Jetset is a training program for affiliate marketers. It is created and continuously updated by John Crestani, a successful entrepreneur who built a $500k/month business while traveling the world according to Forbes. It sounds like a quick rich scheme, however, most of the online schemes use stories of real people. John Crestani is a person who has built a successful business from zero. Of course, it did not happen overnight and there were failures along the way just like any other real story. On this program, where I am a member for over one year, you can find guides, tips, training, and strategies from John Crestani and other super affiliate marketers. The program is created in video format but you can also check resources in PDF format, links to blog posts and other resources. Below on this post, you can read a description of any of these guides and training videos. Internet Jetset is one of the high gravity Clickbank products on the e-business or e-marketing niche and has stayed in that position for a long time. It proves that is not another scammy product that promises quick riches. Also, John Crestani is a super affiliate marketer. So, you learn from someone who has applied what he teaches and he has already proved that these methods work. It is an online business model in which you do not have to own a product or handle customer service. Your job is to promote a product or a service and send traffic to a sales page. Then, you get a commission per sale. Internet Jetset focuses on ways to start an affiliate marketing business with free traffic and a low budget. Also, there is an upsell (Super Affiliate System) for those who feel ready to get started with paid adverting. Who Is Internet Jetset Going To Help? If you want to make money online or you struggle as an affiliate marketer, this program will help you. It is created for any beginner in the online world. How can you understand if you are a beginner? Well, if you do not earn money online or your results until now are not as you want them to be, you may need some help from John Crestani. You only need a computer and internet access to get started with affiliate marketing. An extra budget is not required because John recommends free ways to get traffic. You may need a few dollars per month for some basic tools. Keep in mind that John is a YouTuber too so if you have a camera, you can start right now without any extra cost. YouTube is not the only way to do affiliate marketing. Niche and review websites are great for beginners marketers and you can start a site with $20-$30 per month. So, it is absolutely fine to get started with low or no budget at all and no experience. But if you have some experience as a marketer before, you can use it if you find it relevant to your new business. The intermediate affiliate marketer will find some helpful information too. On this guides, you can figure out mistakes that you are making on your business and fix them. Well, if you have some experience in online marketing, it’s no brainer that the value of the program is much higher than the actual price. On the first part of the training, you can watch five different videos. Welcome Video: An introduction to affiliate marketing and why it works. You will be invited to join the Facebook group of Internet Jetset. On the Facebook group, you can ask questions and communicate with other affiliate marketers beginners or experts. 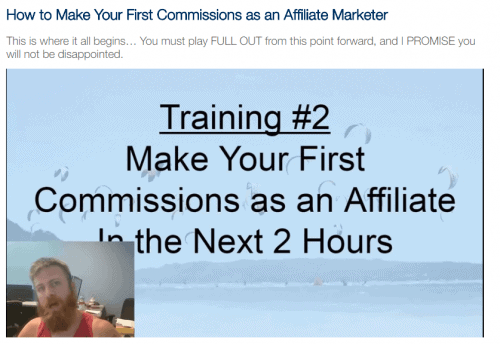 Your First Commissions: John wants to increase the levels of your belief to affiliate marketing. With a simple trick shows you how to earn your first commission. Of course, it is not guaranteed that you will make a sale from the second video but I am sure that at least, you will see some clicks on your affiliate links. Shiny Object Syndrom: All the online marketers must eliminate this problem. If you cannot focus on one task and different things distract you all the time, you must watch this video. Why People Fail: According to John, there are six top reasons why people fail on affiliate marketing. I think that you cannot go to the next step if you make any of these mistakes. Overcome Your Limits: If you do not believe that you can do something better than you do right now, you prepare yourself to fail. Limiting beliefs can be a reason why you do not get the success you want. 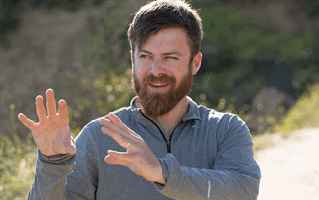 There is a nice exercise on this video to overcome any limiting belief (one at a time). The right mindset must be a focus. While most online programs do not include any relevant training at all, on Internet Jetset, the mindset is the first thing you need to work. Affiliate marketing always starts with a niche. A niche is an audience that your business is going to help in the future. For example, if you want to get into the make money online niche, you must help people to make money. If you want to get into the fitness niche, you must help people to improve their fitness, lose weight, build their abs or any other problem you can help them solve. There are thousands of subniches that work. If there is a product that makes sales, you can promote it as an affiliate marketer and earn commissions. John Crestani recommends two ways to find your niche. Of course, I cannot reveal them. You must buy the program to find them out. However, there are really straightforward and you can choose your niche in a few minutes. Below the training, there are some recommended affiliate programs and an exercise to help you go to the next step. SEO traffic is the #1 source of traffic on the internet. While there are alternatives to get free and targetted traffic most successful online marketers agree that is the best investment you do for your business. If you have chosen your niche, it would be a good idea to start building a website which will be the first asset to your affiliate marketing business. On the training of Internet Jetset about SEO, you can find a video by John Crestani, a PDF guide with 123 pages with a complete strategy, and resources below the training. 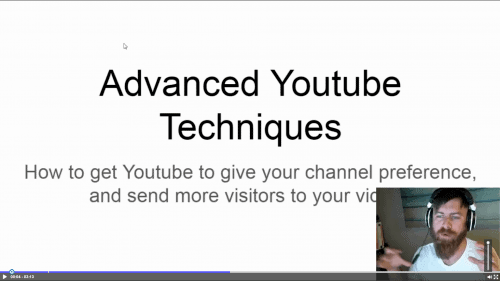 The video includes examples of affiliate websites. You can start a review website or an affiliate blog. Both of them work well. Later in the same video, there is keyword research training and some tips from John Crestani. The PDF guide was the main training of Bring The Fresh, a legit training program that is no longer active. You can learn how to build your website and prepare it for SEO. However, it uses some backlinking and content creation strategies that most online marketers do not use anymore like buying backlinks and create content only for search engines (and no for your visitors). On the positives, it is recommended to get started with an expired domain name which can save a lot of time because, with a new domain, you need to build trust with search engines. It is not easy to find a good expired domain name but you can follow the instructions of the training. Also, he focuses on the sales pages of your websites. Lastly, there are links to helpful blog posts in which you can find additional information. The SEO training is good but not great. In my opinion, it can work if you do the required work. The only big problem is the backlinking strategy on the PDF guide that you can avoid. Simply, do not create link networks. Later, there is another training for review websites. If you want to build a review website, you can go directly on it. YouTube is the second website in the world in traffic and John Crestani is a great YouTuber. When I joined Internet Jetset, I started with the YouTube guides. And it was as expected. A great step by step training. 14 video guides on how to get started with video marketing. When you watch them, there are links to other helpful resources and YouTuber channels which can help you create a profitable channel. On the first video, you can see examples of other channels, how you can find products to promote and other general information about affiliate marketing on YouTube. The next videos are step by step guides that show you John Crestani’s strategy. You can watch short videos about a simple action like how to upload a video to YouTube or more complicated training about call-to-action, write great headlines and more. There is a lot of useful information on this training that can give you an advantage over your competition. If you create videos consistently and follow the instructions, you can expect good results, subscribers, and sales. 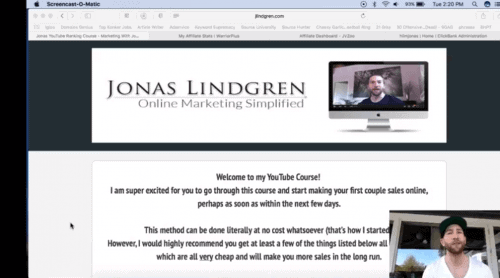 This a second training on YouTube by Jonas Lindgren. Jonas is a more consistent YouTuber than John Crestani but he has a smaller audience, probably because of his smaller niche. Jonan creates reviews on making money products and this is exactly what he teaches on this course. He shares on this course all the parts of his business. You learn step by step how to start a YouTube channel, find products, make the reviews and more. 11. How To Rank Videos Fast! There are 14 videos that show you how exactly you can get started with this business model. 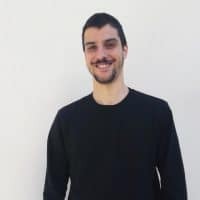 You can see how Jonas contact the product owners, how he ranks the videos and what methods he uses to earn money. You just need to do the same thing once you have watched the video. To apply this model, you must be willing to get started with the make money online niche. The only negative is that Jonas promotes all the product he reviews. Of course, you can review the products in your own way and decide which one to promote or not. The advantage is that he makes only real reviews and present on the viewers what exactly they will get if they buy a product while he gives some bonuses to increase conversions which is a good idea to apply in your own reviews. John Crestani shows how you can use Facebook for affiliate marketing. The idea is that you create and grow and Facebook fan page in the niche. Again, there is a video to watch with examples and resources at the end of the page. The training shows you how to build and grow a Facebook Fan page organically. All the examples that John shows you on this video are by fan pages that are connected with a website. It is important to build a website even if you plan to work only with traffic from Facebook. Through time, you will get organic traffic and you can promote your affiliate on your posts. Affiliate links are allowed on Facebook but if you are too spammy, you will not get followers or likes and Facebook may close your page. So, if you build a website is a safer and more effective way to get started. Then, you can share your content on Facebook. Also, it’s fine to create posts only for your Facebook page without affiliate links. Comparing it with the other two methods, SEO and YouTube, it is not so effective but still, it can work. On the training, you can see what type of content works well with Facebook, how to share it and monetization tips. On this part of the program, you will learn how to build your first website, a Facebook page and add an email box on your website. A website is a suggestion for any online business. Even if your strategy is to get traffic with social media or YouTube, you will be benefited with an active website. It builds trusts between you and your audience, you can create a brand name (your domain name), and you can use it for marketing reasons as well. For example, you can add more affiliate links, collect emails from your visitors, add social buttons to get more shares on social media or add a contact me page. However, the most important benefit is that you can start getting organic traffic from search engines. It will happen sooner or later if you remain consistent and publish unique content. In my opinion, you must start right away to develop your SEO skills. For all these reasons, a website can help your affiliate marketing business. You can find in this part of the training 15 step by step videos to build a WordPress website. WordPress makes it possible for people who have no technical knowledge or experience to build nice websites. So, you do not have to worry about coding or web design. With the training, you can customize your site in any way you want and focus on your marketing skills. Internet Jetset does not offer web hosting, autoresponder, domain names or any other tools. You must pay extra money for these tools. The cost depends on the tools you will choose. I would start with Bluehost, almost $20 per month, and Aweber, $19/mo. So, you have a business with $39 per month. You will learn some basics about copywriting. The course includes seven videos on different copywriting techniques. All the videos are created by Ronnie Sandlin who is introduced as a student of John Crestani and successful entrepreneur. Many online marketers on different business models say that they are copywriters and not just writers because of their ability to sell with their articles and videos. Good copywriting skills will help you to convert better and make more sales than an affiliate marketer who has not developed these techniques. On these videos, you will discover some interesting ideas to include in your content. After watching the training, you can connect with Ronnie Sandlin on social media for more information and ideas. Launch Jacking was a part of another course but now it is included in Internet Jetset. The training is created by Pyong Kim, a seven-figure affiliate marketer according to the description of the program. 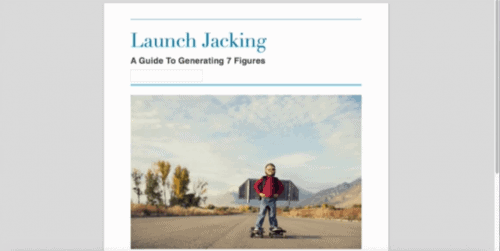 Launch Jacking was a popular affiliate marketing model and still, many marketers apply it and make money with this super simple strategy. The idea is that you find new digital products and buy a domain name that includes the product name you want to promote to get a slight SEO advantage for product keywords. I know that Google does not focus on exact domains anymore so it will not work as it did a few years ago. However, it is still a ranking factor and if your competitors are not other authorities sites, you can get ranked on the first page of Google. With that method, you will not get tons of traffic but your visitors will be interested in buying or learning more information about the specific product. If you follow the training, you will learn how to find profitable products to promote, buy a good domain name, write the content, and promote it. The are some cons to this method too. First of all, you do not add value to your visitors but it’s a spammy way to do affiliate marketing. Also, it is recommended to buy backlinks to get ranked. It makes sense that there is a high risk to get banned from Google and lose all your work until that point. However, if you make a good product selection and follow the training, you can earn some commissions fast. In my opinion, it would be better get started with the Google or YouTube strategy above. A standard review website, a blog or a YouTube channel has more potential in the long run and it’s unlikely to get banned if you do not do anything wrong. Another training that was included in another program as well and it is created by Donny Gamble. The previous strategy on the Launch Jacking was a grey hat SEO strategy. Here you can find only white hat SEO strategies and tips. 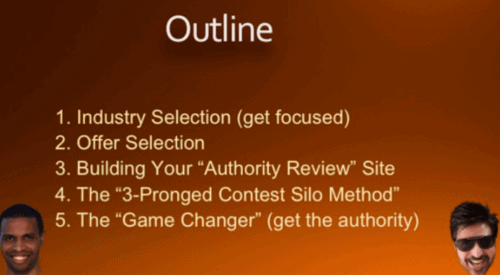 The review site examples earlier on the Google training was similar to the example of Donny Gamble. He shows what he does to choose the niche, find the products, build the site and finally make money. The goal of these sites is passive income. But it does not mean that they work on autopilot or you do not have to work to build them. Donny Gamble mentions on a video that you must keep track of your keywords because soon you will have targetted over 400 targeted keywords! This strategy is based on the unique, quality content and he uses some techniques to promote the affiliate links. There is a backlinking strategy but it is about natural white hat backlinks that they add value to a website according to Donny Gamble. There are five videos of total duration over 100 minutes on the Authority Review Sites strategy. This is the only paid advertising training on Internet Jetset and there is also a short video on Launch Jacking about Facebook ads. However, the Super Affiliate System which is an upsell of the program is focused only on affiliate marketing with paid advertising. On this course, you will watch 7,5 hours of training of Facebook ads. It is created by Carlos Cruz, an entrepreneur who generates 6-figures per month from Facebook ads. You will not use the Facebook Ads training that you will learn from these videos as a part of your marketing strategy to promote your website or your YouTube videos. But you learn to work only with Facebook and a landing page where you promote a specific product. It’s a different affiliate marketing model than the previous ones. You will need a budget and some tools that he uses in the example campaigns. Next, you must follow every step you can see in these videos. In my opinion, it is a good training, the method he uses is legit, and it can work if you apply what you learn properly. I would not recommend it to beginners who are not ready to risk or they cannot afford to lose money. Paid advertising has always a high risk even you do anything in a right way. So, make sure you can afford it or start with the free traffic methods of the program. I have written another article about the Super Affiliate System which you can read here. So, I will not analyze the training but I just want to mention some basic details. The price of this upsell is at $997. Some months ago, it cost $297 and the fact that it was a really helpful training increased the price. If you have bought the Super Affiliate System at $297, you still have access. Also, there are many updates the last few months that you need to check. We can agree that $997 is a high price. However, it is a great training about paid advertising. While I do not use all these methods and I do not agree with some of them, you learn to start a business right now based on programs like Google AdWords, Facebook ads, native ads, and YouTube Advertising. There are ready to launch campaigns, landing pages and other resources you can use right now to get started with no experience or research on the products. Of course, you must not join it if you cannot afford to spend money on advertising campaigns because no one can guarantee that you will have a profit. This is the last upsell of Internet Jetset. Once a week, John Crestani hosts a webinar. The cost of the webinars and the replays of the previous ones is at $47/month. They last over three hours and John answer questions, recommend ideas and strategies, review sites or channels and more. In my opinion, it is always a good thing to get advice from a millionaire. I know that the cost goes up so you decide to join or no. I usually watch these webinars on replays because of the hour difference but I have watched some of them, asked questions and talked with John. There is a lot of value to watch live videos from people who already have what you want and there is even more value when you can talk to them. On the last part of Internet Jetset, you can find the affiliate interviews. It is not an upsell. You have access to these interviews the basic program. You can find many videos from different people who were invited by John Crestani to share their experience. They are successful affiliate marketers with success stories, study cases, paid advertising stories, strategies, and other videos by John Crestani which are not included in the training. There is a lot of value here and many hours of training. I was really motivated when I watched some of these stories and if you decide to join Internet Jetset, you must take a look at the interviews. When you join the program, you can find a link for the Facebook group of Internet Jetset. If you need any help, this is where you can ask your questions and get answers. The group has over 5k members. Many of them are active and can help you with any issue. John Crestani is active in the group as well. Support and community are essential parts of your progress because you will need some help sooner or later. I believe that you will be fine with the Facebook group. 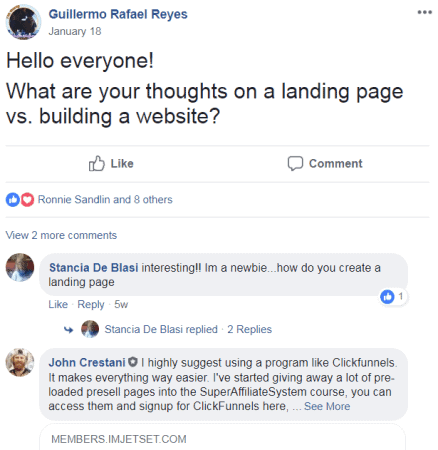 On the image above, you can see a like from Ronnie Sandlin, another super affiliate who has created the copywriting lessons of Internet Jetset. For technical issues, you can contact the support inside the program. I cannot say that the cost of the basic program is expensive. With $47 you can get access to all the guides you can read above in this article. There are over 100 hours of training (only the bonus below is 24 hours). Also, the videos are unique. John Crestani and the other super affiliates who participate in this program share their personal experience and how they have built their businesses. You cannot find many affiliate training programs at the same level and the $47 one time fee is a good investment for the information you can get from the program. Next, there are two upsells that cost more than the program. No one likes upsells for sure. To be fair, they are not necessary to make this program to work for you. So, the excuss “I did not make money because I could not afford the upsells” do not apply here. You can build a profitable site or a channel following the available guides and then if you feel that you need additional training, you can reinvest some of your earnings on the upsells or other programs. Also, I do not recommend the Super Affiliate System if you cannot take action and use the free traffic guides properly. Simply, you will make the same mistakes again. So, make sure you can work with the available training. My suggestion is to buy the system, a domain name, host provider, and an autoresponder. It will cost you $47 to get started and then, $39 per month for the needed tools. If you want to get started with YouTube, you can start only with the $47 fee. You can find on the internet so many people who claim that they have a system that earns million. Usually, they show you fake screenshots and fake accounts as a proof of their success. However, John Crestani is a real millionaire and you can read his story on huge sites like Forbes and Business Insider. John Crestani says that there is not one method or one system. There are many ways to make money but people show you only what they know. They have found a system that works for them and sell it. However, it does not mean that it will work for you. You have a different personality and different talents. On Internet Jetset, you can watch many strategies from super affiliates and examples of sites and channels that work to choose what is the best for you. On every guide of this program, you can start from zero and follow all the steps to the end. No hidden information or unpleasant surprises. You can how the super affiliates work, the sites where those guys outsource some tasks, how they contact the product owner to ask a copy of a product or specific sites you can use as examples. If you do not know how to continue at any point, you can just ask a question on the Facebook group. At the end of every training, you can find some additional resources. Usually, they are links to other sites or guides. John has no problem to show you great articles from sites that sometimes promote other programs, email lists, and guides. He focuses on giving you the right information to start your own business. I will not mention on the cons the two upsells because you do not have to buy them. You can make it work without them. There are affiliate links for every recommended tool! I know that we learn about affiliate marketing and John is a successful affiliate marketer but he could avoid it. This is a paid program so he has already earn money when someone joins. Also, there are the upsells for those who are willing to invest more money. He promotes MOBE as his #1 recommended affiliate program which is an MLM company with upsells up to $30k and a negative BBB rating. There are many guides and business models that you can learn on Internet Jetset. I have already mentioned which of them I prefer (Google’s Free Traffic and YouTube’s Free traffic). But you can use the other guides as well and get great results. There is not only one way to do affiliate marketing. The super affiliates who have created these guides prove it with their results. Choose the one that works for you. Internet Jetset has a lot of information and resources that you can use to get started. Also, there is an active Facebook group where you can get help from fellow affiliates and find inspiration on the success stories of other people. Overall, it is a top training program for all the affiliate marketers and anyone who wants to make money online. Now, it’s your turn to use these guides and build your own affiliate marketing business. Your results depend on your actions. So, take action and make it work. Click Here To Watch A Free Webinar By John Crestani!! Thanks for reading my review of Internet Jetset! If you want to ask any questions or share your opinion about the program, leave your comment below.